20th December 2018. 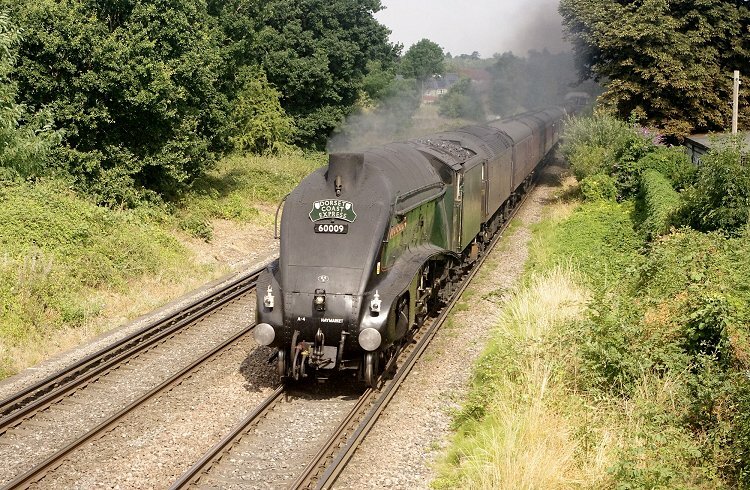 Steam locomotive 35028 "Clan Line" heads excursion train 1Z92 from London Victoria to Sherborne at Addlestone Moor. 19th December 2018. GBRf electro-diesel locomotive 73964 heads test train 1Q53 from Eastleigh to Wimbledon as it passes through Esher station in poor light. 14th December 2018. 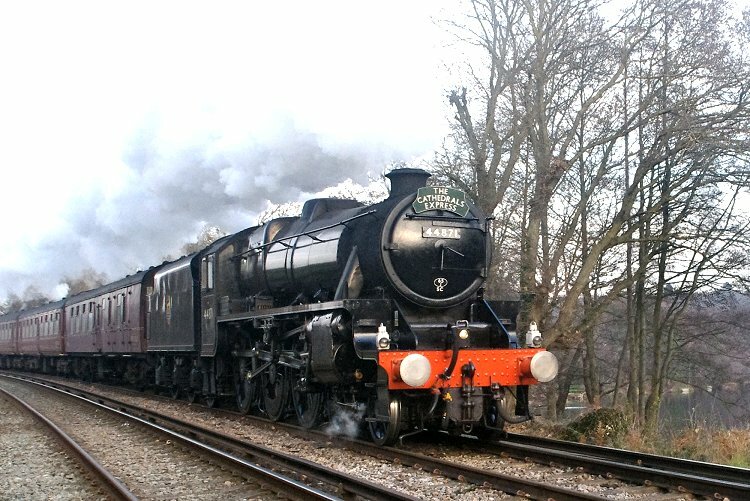 Stanier Black 5 4-6-0 number 44871 passes "The Swamp" near Byfleet Junction with train 1Z45 from Ashford in Kent to Alton in Hampshire. 13th December 2018. 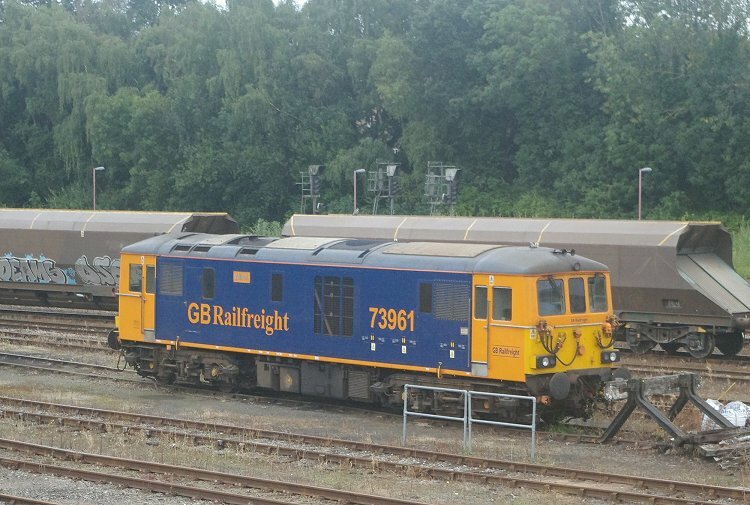 GBRf diesel-electric locomotive 66756 heads relatively new empty gypsum wagons as train 4Y19 from Mountfield in Kent to Southampton Docks. 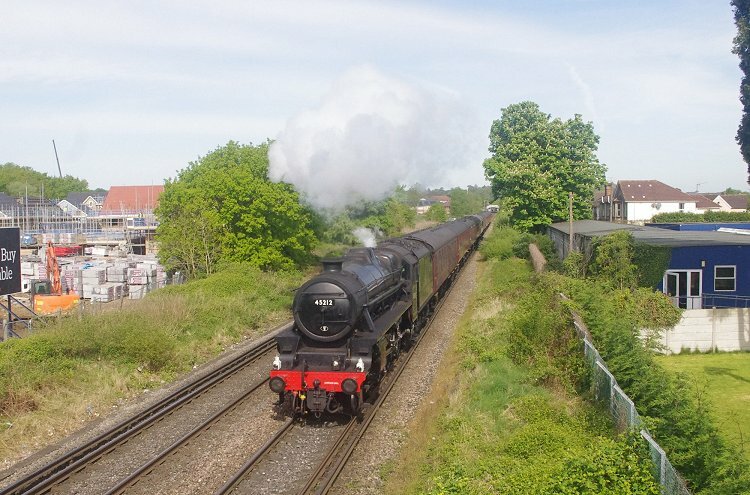 It is seen passing Coxes Mill at Addlestone in shadow. 11th December 2018. 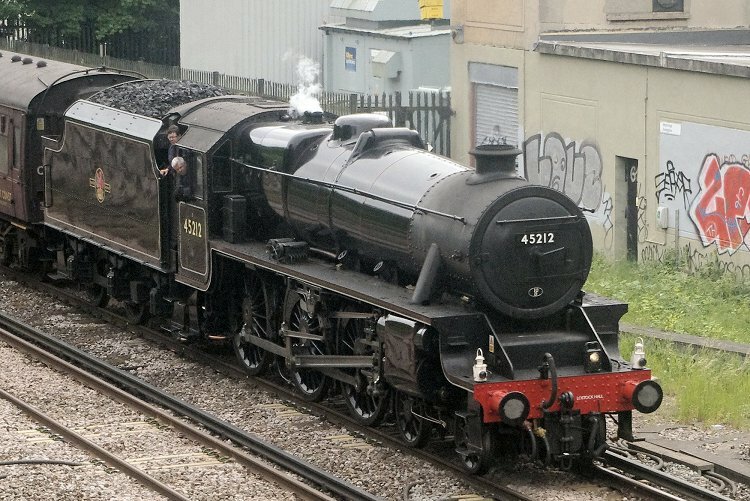 Black 5 steam locomotive 44871 approaches Addlestone Moor footbridge heading excursion train 1Z02 from London Victoria to Yeovil. 8th December 2018. 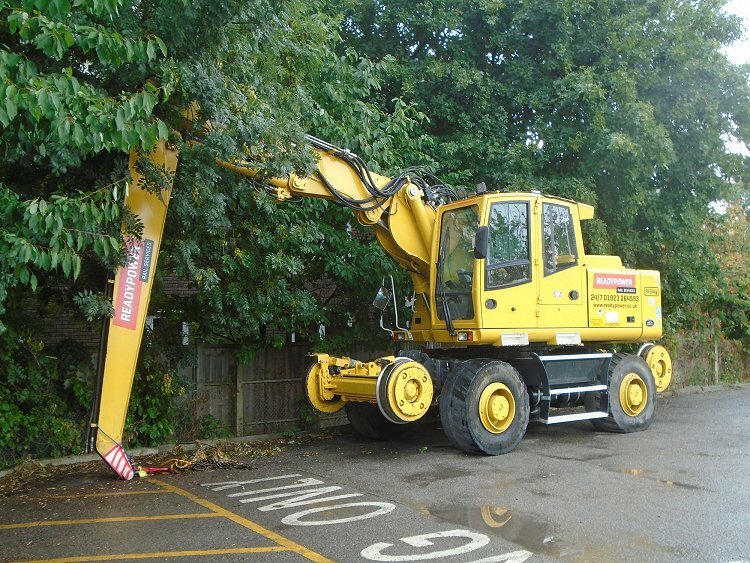 Road / Rail Readypower engineering machine 99709 940075-3 stands in the car park at Ewell West station. 6th December 2018. 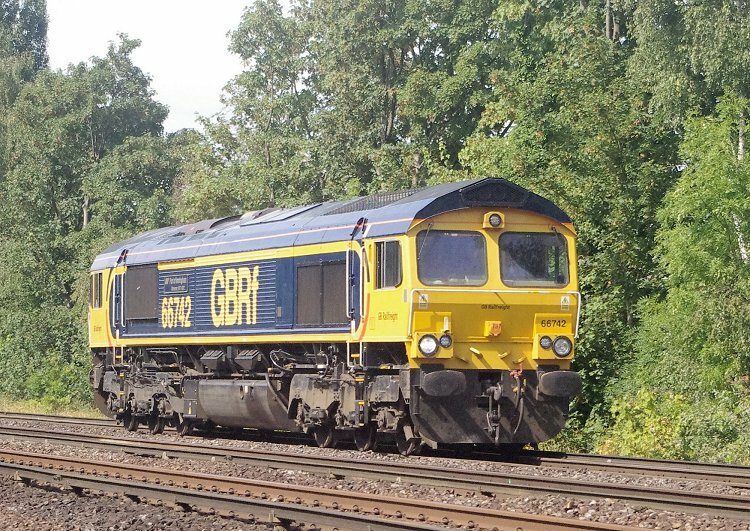 An engineering train headed by a GBRf class 66 loco waits to leave the engineering possession. Another engineering train can be seen in the distance at Redhill station. The lighting conditions did not favour photography. 3rd November 2018. Great Western Railway (GWR) King class 4-6-0 steam locomotive "King Edward II" runs along the demonstration track at the Didcot Railway Centre. The locomotive was built at the GWR works at Swindon in 1930. 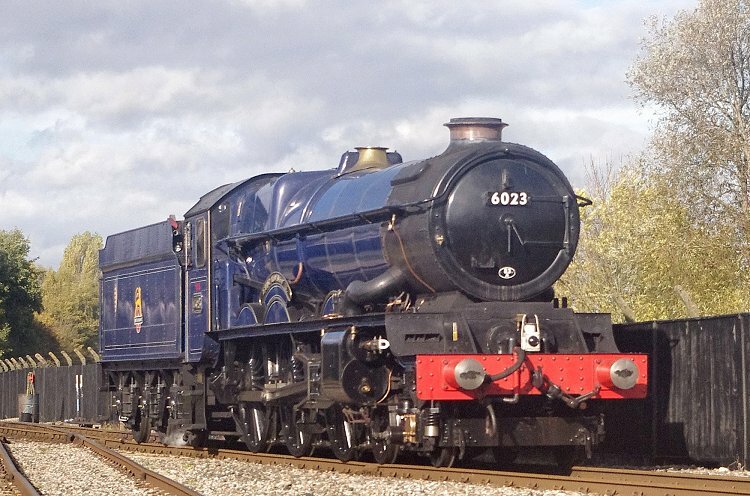 It has been restored in an experimental British Railways blue livery that was evaluated against other colours when deciding the express locomotive colour to be used on the then recently nationalised railways in Britain. 24th October 2018. Diesel-electric locomotive 37254 passes through Esher station on the Up Slow line with test train 1Q53, working from Eastleigh to Wimbledon. Another class 37 is at the rear of the train. The first vehicle is a former Scot Rail DBSO (Driving Brake Second Open) coach that was previously allocated to the Glasgow - Edinburgh shuttle services. 20th September 2018. 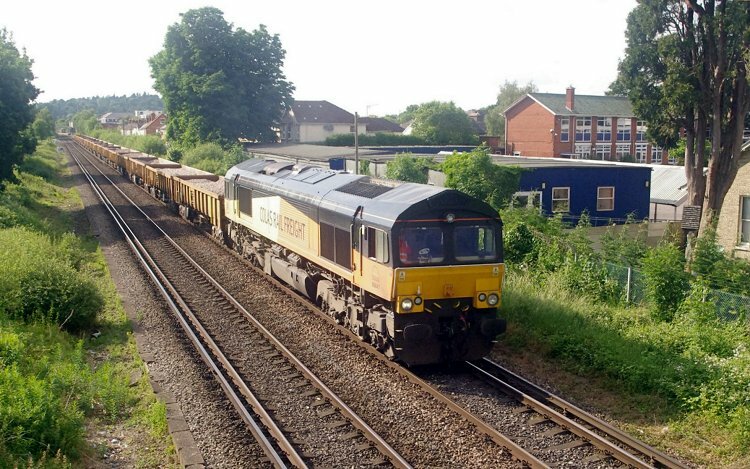 Diesel-electric locomotive 66772 in GBRf livery has passed through Chertsey station (in the background) and approaches the Addlestone Moor footbridge with gypsum container train 4Y19 from Mountfield to Southampton Docks. 13th September 2018. 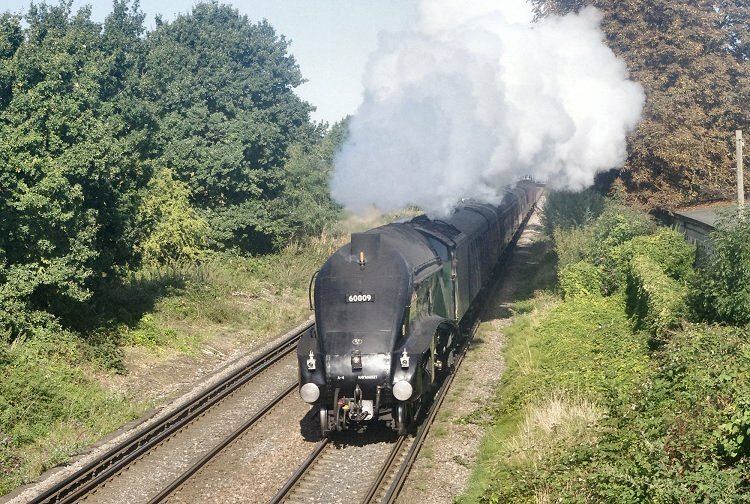 Ex-LNER A4 class steam locomotive 60009 "Union of South Africa" heads train 1Y50 from London Victoria to Swanage as it approaches the Addlestone Moor footbridge..
6th September 2018. 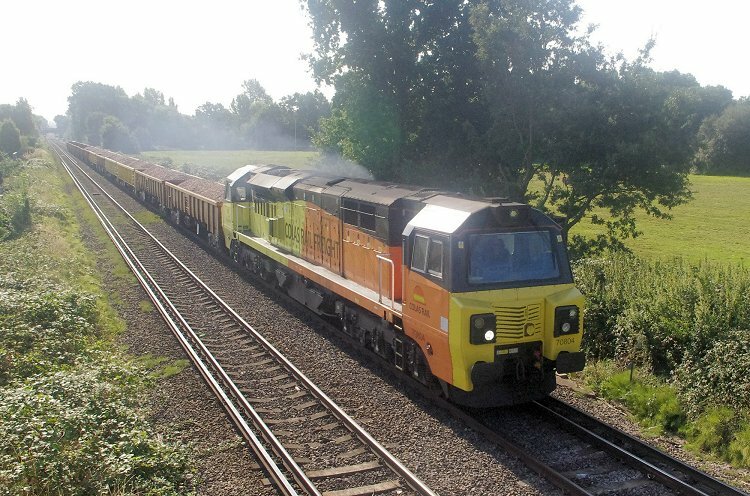 Colas Rail Co-Co diesel electric locomotive 70804 heads engineering materials train 6Y48 from Eastleigh to Hoo Junction at Addlestone Moor, as it approaches Chertsey Station. The first two wagons in the train were built in Romania and the second two in Poland. 3rd September 2018. 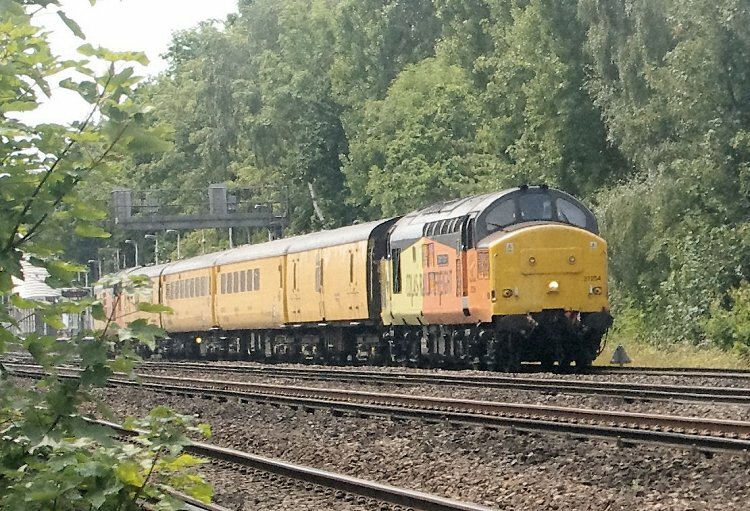 Colas Rail locomotive 70804 heads train 6Y48 through West Byfleet on its way from Eastleigh in Hampshire to Hoo Junction in Kent. 29th August 2018. Diesel-electric locomotive 37612 looks smart in its blue livery as it brings up the rear of test train 1Q53 as it runs through Esher on the Up Slow line, working from Eastleigh to Wimbledon. 25th August 2018. Diesel-electric locomotive 66106 in EWS livery heads engineering materials train 6C02 from Eastleigh to Herne Hill as it passes Esher on the Up Fast line. It is seen approaching the bridge over Hampton Court Way. 23rd August 2018. 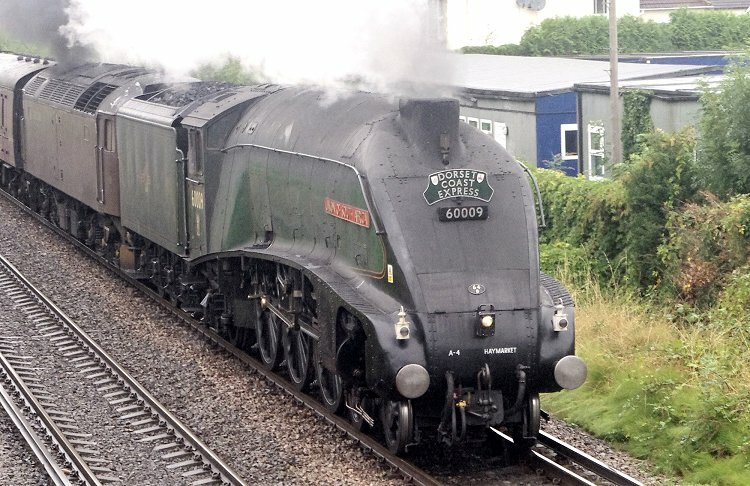 Former LNER class A4 Pacific 60009 "Union of South Africa" approaches the Addlestone Moor footbridge with train 1Y50 "Dorset Coast Express" from London Victoria to Weymouth on this damp day. 18th August 2018. 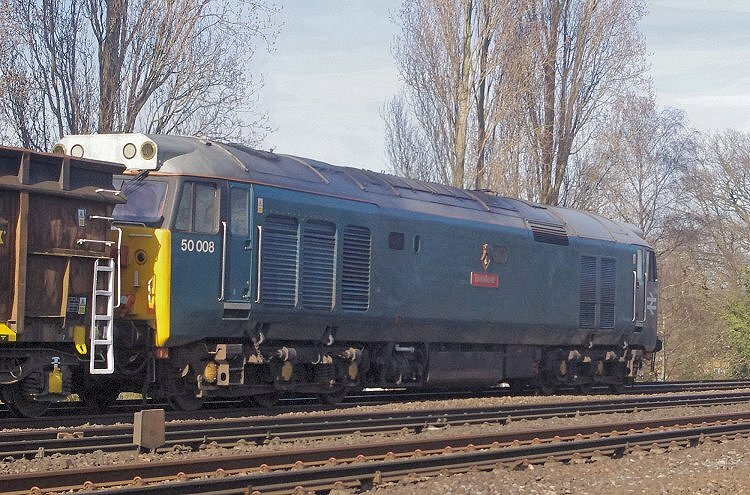 Electro-diesel locomotive 73961 rests in Tonbridge West Yard. 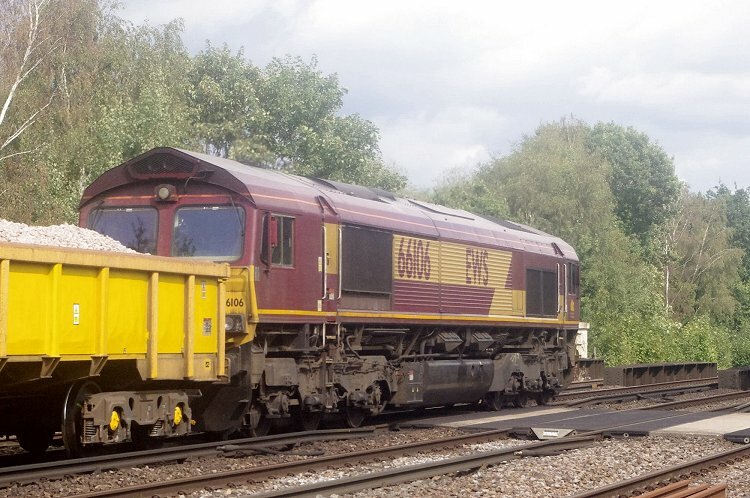 The hopper wagons behind are former Freightliner coal hoppers that were transferred to sand traffic. 10th August 2018. 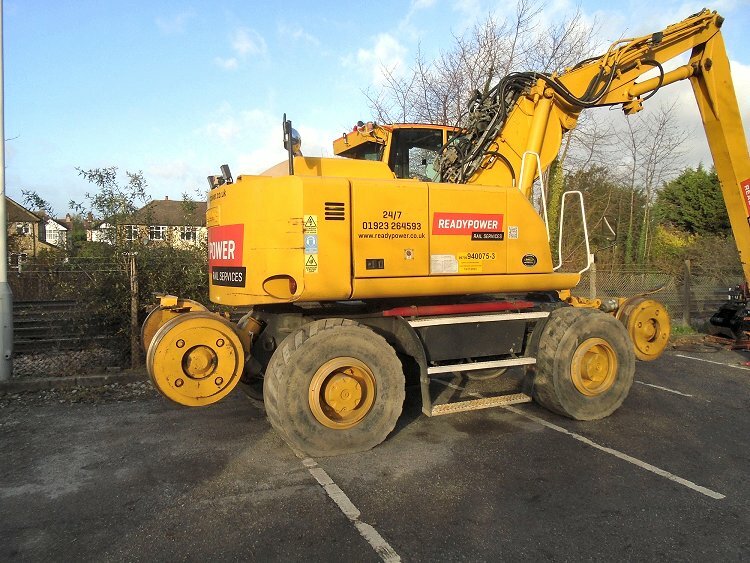 Road / rail machine 99709 940710-5 was in the car park at Ewell West railway station. 8th August 2018. 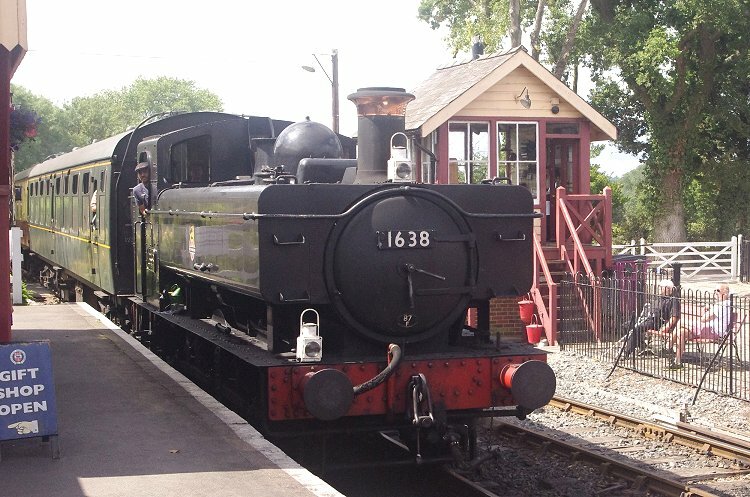 Former British Railways 0-6-0PT steam locomotive 1638 arrives at the Tenterden terminus of the Kent & East Sussex Railway. 7th August 2018. 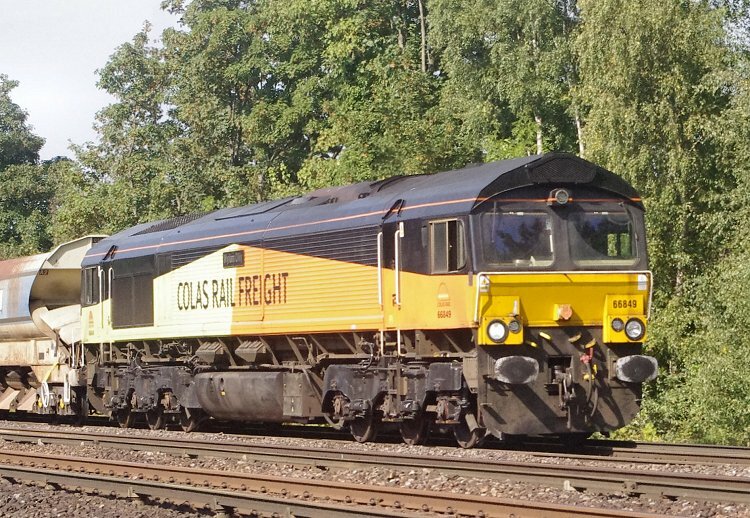 Colas diesel-electric locomotive 66848 heads train 6Y48 from Eastleigh to Hoo Junction at West Byfleet with a train of "Autoballaster" hopper wagons. The wagons operate in sets of five, and this train was composed of two sets of five wagons. 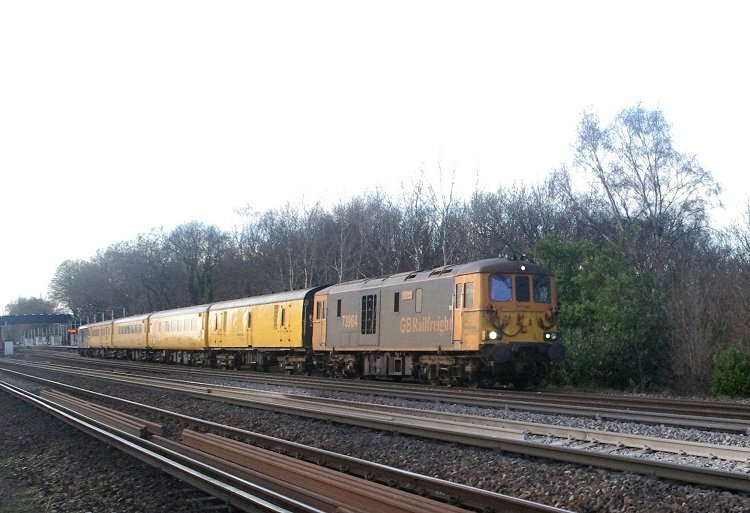 One set was in the old blue and white Railtrack livery, while the other was in Network Rail yellow. 4th August 2018. 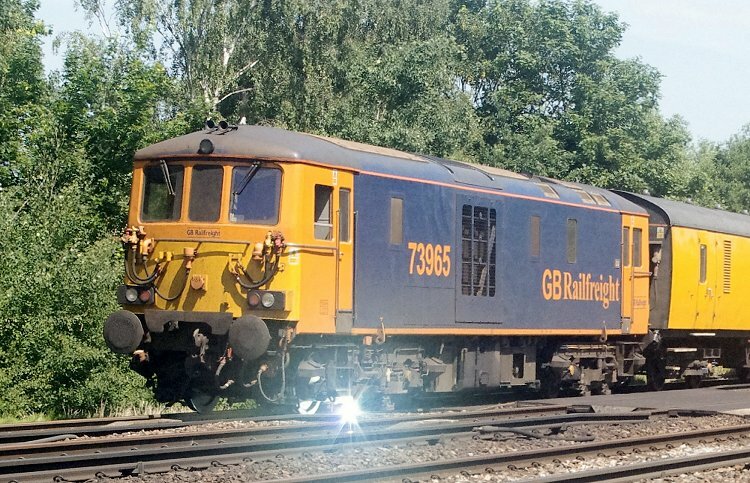 GBRf diesel-electric locomotive 66742 runs "light engine" at West Byfleet. 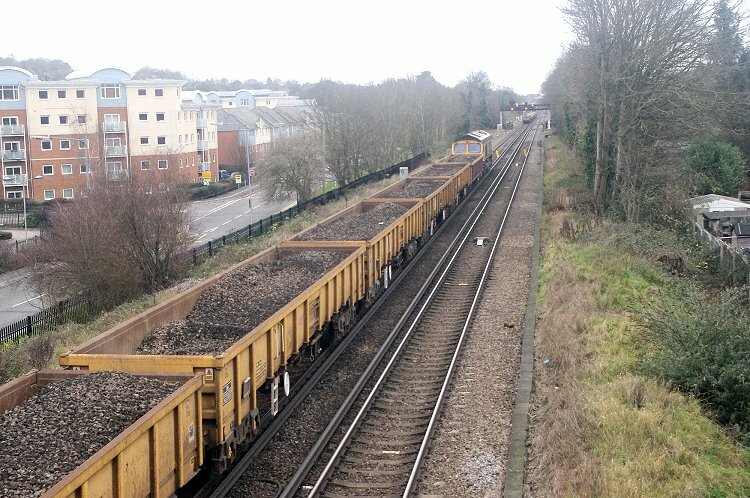 It was due to move a train of wagons from Southampton Docks, but apparently a track fault prevented the wagons from leaving the siding on that day and the loco departed without its train. 26th July 2018. 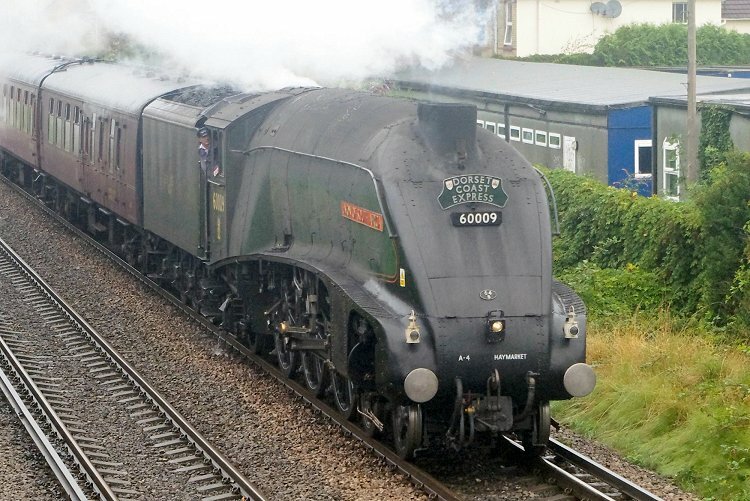 Ex-LNER class A4 steam locomotive 60009 "Union of South Africa" heads train 1Y50 "Dorset Coast Express" from London Victoria to Weymouth as it leaves Chertsey and approaches Addlestone Moor. 23rd July 2018. 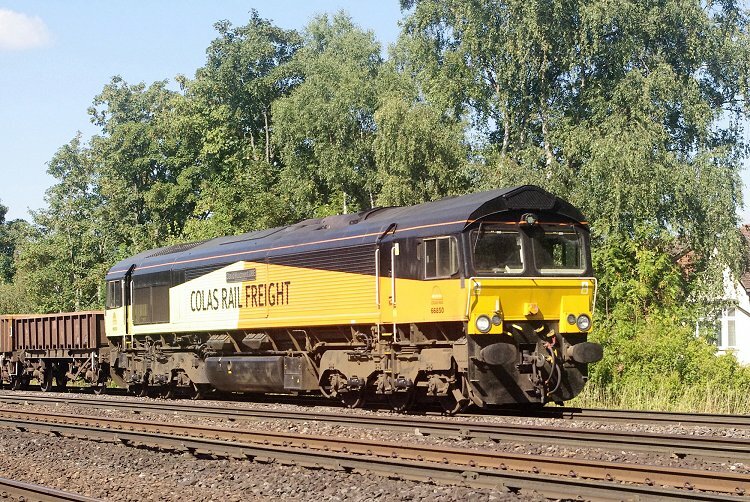 Colas Rail 66850 heads engineering materials train 6Y48 from Eastleigh to Hoo Junction as it passes through West Byfleet in the morning sunshinw. All except the second wagon in the train were type MHA, consisting of a replacement open body on a former HAA "Merry-Go-Round" coal hopper wagon chassis. The second wagon, part of which is visible in the photograph, was type MFA. 15th July 2018. Diesel-electric locomotive 66155 heads an engineering work train 6N31from Nunhead to Eastleigh as it passes Addlestone Moor at Chertsey. 14th July 2018. 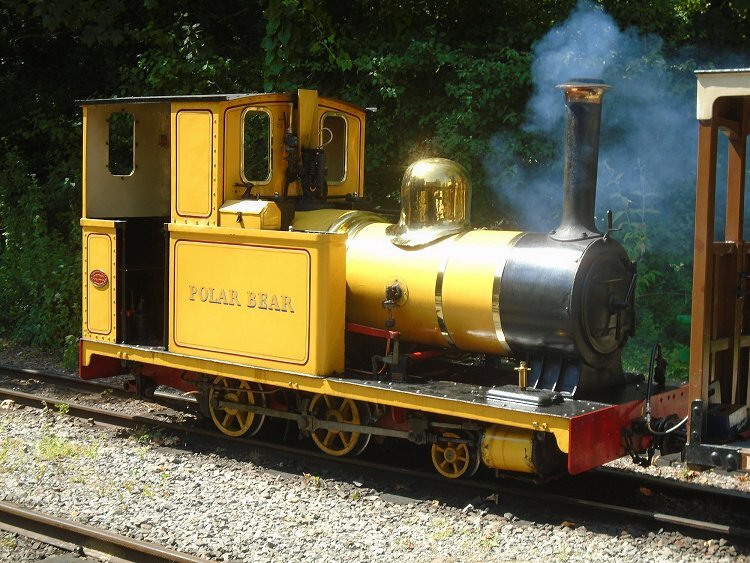 Yellow 2-4-0T steam locomotive "Polar Bear" was built for the Groundle Glen Railway on the Isle of Man and was used to take visitors to the zoo. The loco was built by W. G Bagnall & Co of Stafford as their works number 1781 in 1906. It is seen operating at the Chalk Pits Museum in Amberley, Sussex. 7th July 2018. A piece of railway archaeology. 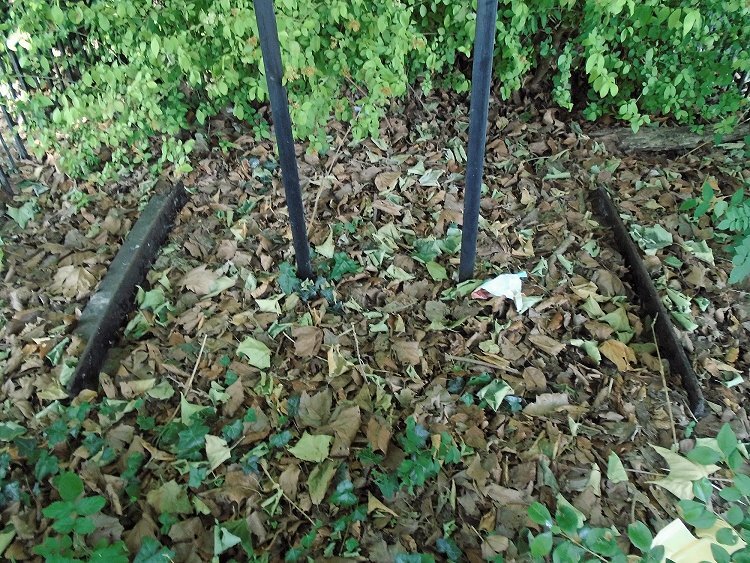 Two preserved sections of "L" shape cross section cast iron rails standing on stone blocks are almost hidden by leaves and rubbish at Rotary Field, Purley. Back in the early 1800s this was the route of the horse-drawn Croydon, Merstham and Godstone Railway. At this location the plateway ran along a slight slope on a shelf made from compacted soil. The route of the former plateway through the park is easily visible because it is now a footpath. The two vertical posts that can be seen in the photograph support a sign describing the plateway. 6th July 2018. 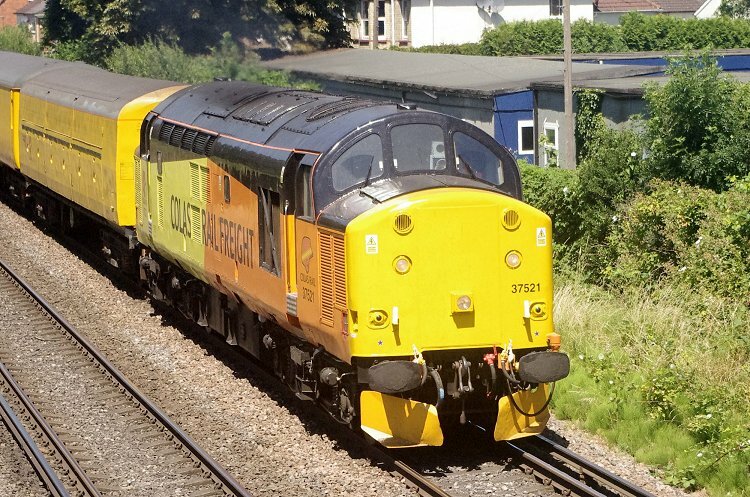 Colas diesel electric locomotive 37254 hauls test train 1Q54 from Eastleigh to Hither Green and is seen as it passes West Byfleet station..
4yh July 2018. 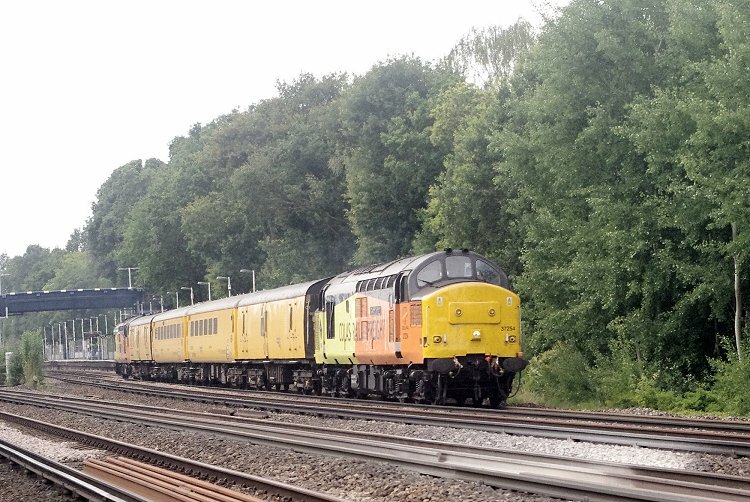 Colas diesel electric locomotive 37254 hauls test train 1Q53 from Eastleigh to Wimbledon. 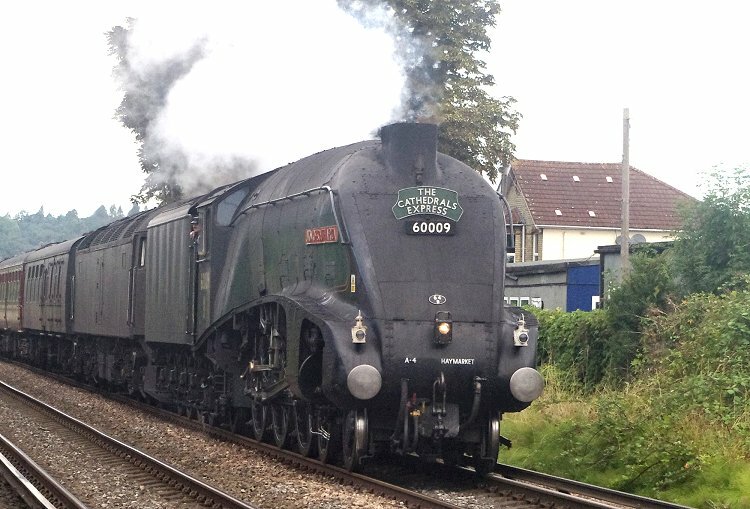 It is seen on the Up Slow line as it passes Esher station. 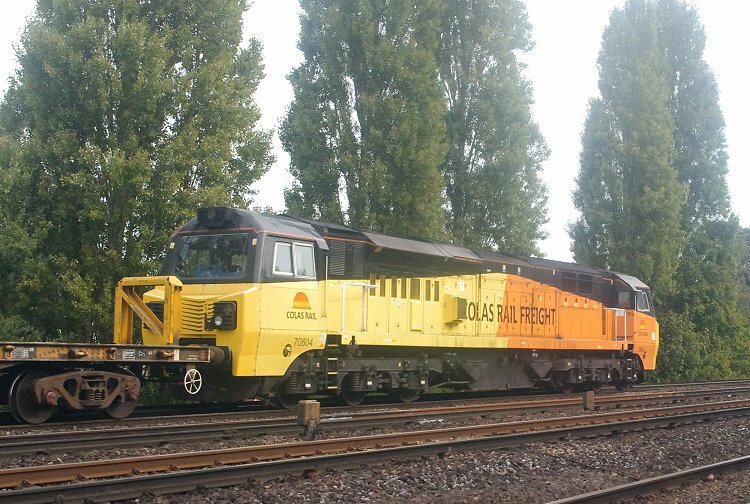 Another Colas locomotive, number 37175, is at the rear of the train. 1st July 2018. 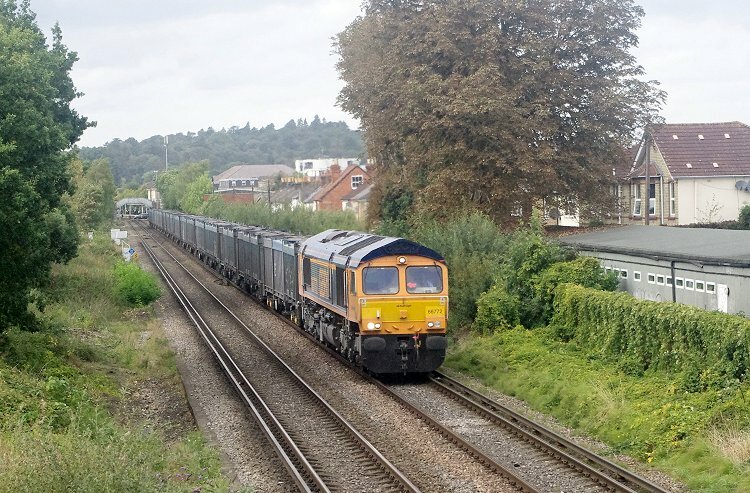 GBRf diesel electric locomotive 66786 appear to have a minor problem, as it throws out dirty exhaust emissions as it passes Addlestone Moor with with GBRf staff charter train 1Z76 from Tonbridge to Eastleigh. The carriages forming the train were all ex-BR Mark 1 type, one in carmine and cream livery and the remainder in chocolate and cream. 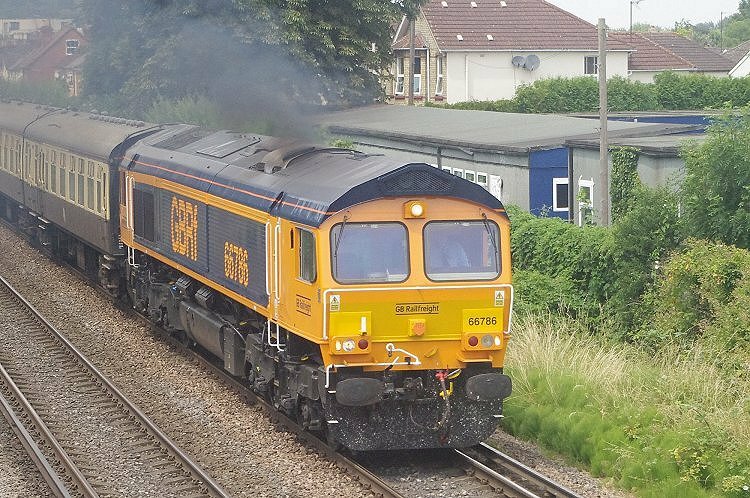 At the rear, out of sight in this photo, was GBRf loco 66755. 29th June 2018. 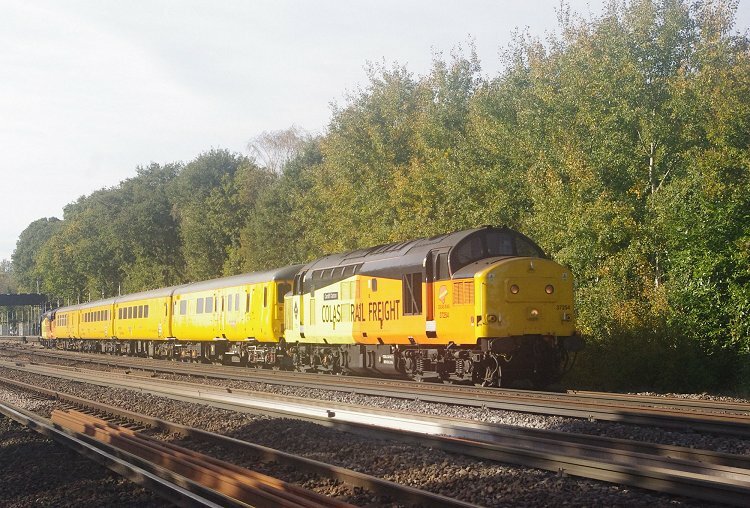 Colas Rail diesel-electric locomotive number 37521 shines in the sunshine following its recent overhaul and return to traffic as it passes Addlestone Moor with a test train. 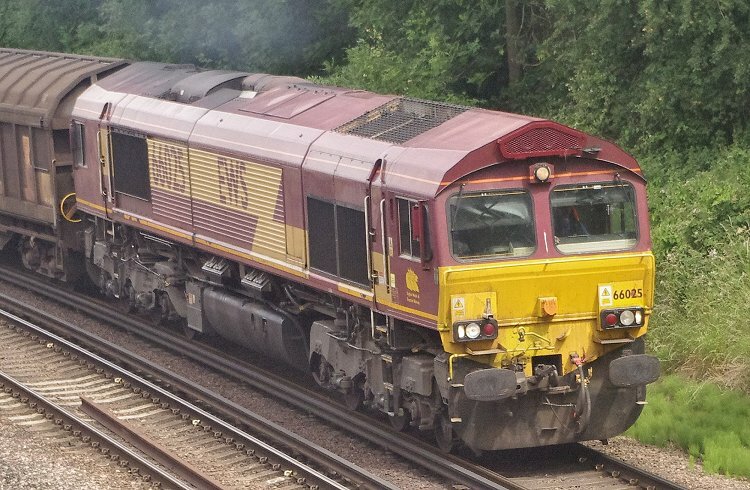 The train is 3Z80 from Hither Green to Eastleigh and the first vehicle in the train is a former car carrier. 17th June 2018. 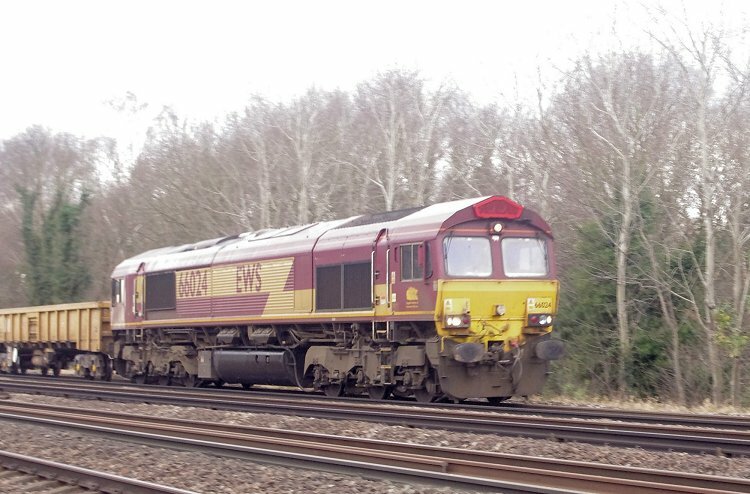 DB diesel-electric locomotive number 66025 hauls train 6M13 from Dollands Moor to Daventry, composed of a string of German vans and some containers on flat wagons. 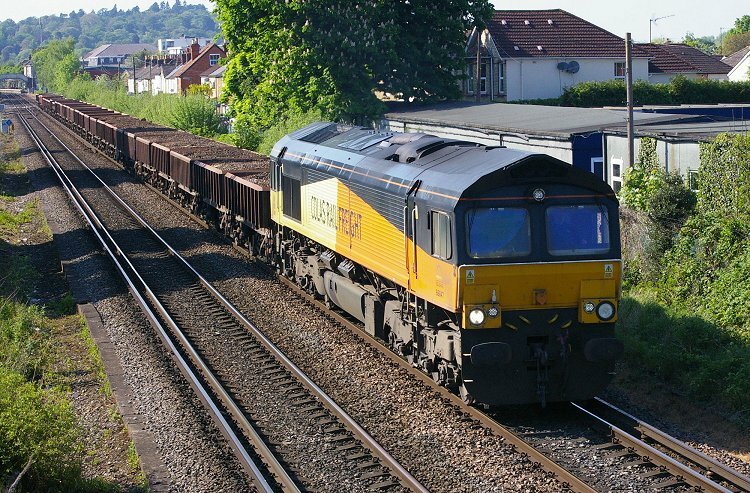 It is seen passing Tonbridge West Yard on the original South Eastern Railway route to Redhill. The load was aluminium from Germany, the containers are for distribution by road from Daventry, while the vans will continue by rail to their destination on Merseyside. 6th June 2018. 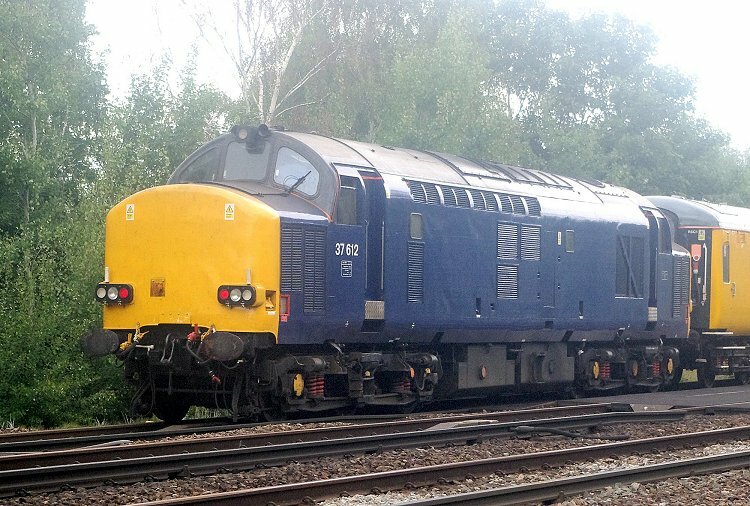 Re-engined electro-diesel locomotive number 73965 at the rear of test train 1Q53 as it operates from Eastleigh to Wimbledon. The photograph was taken at the exact moment of a spark from the collector shoe on the locomotive's rear bogie. 5th June 2018. 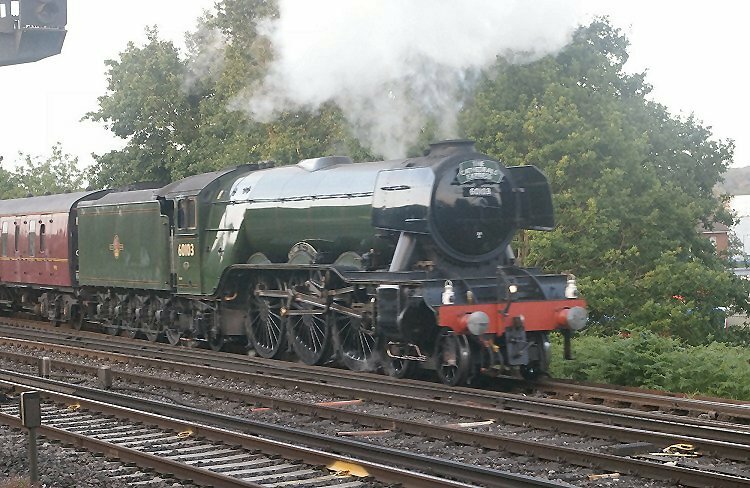 Ex-LNER A3 Pacific steam locomotive 60103 "Flying Scotsman" leaves the branch line from Virginia Water and joins the main line at Byfleet & New Haw at dusk with train 1Z75, a circular tour from London Victoria. 2nd June 2018. 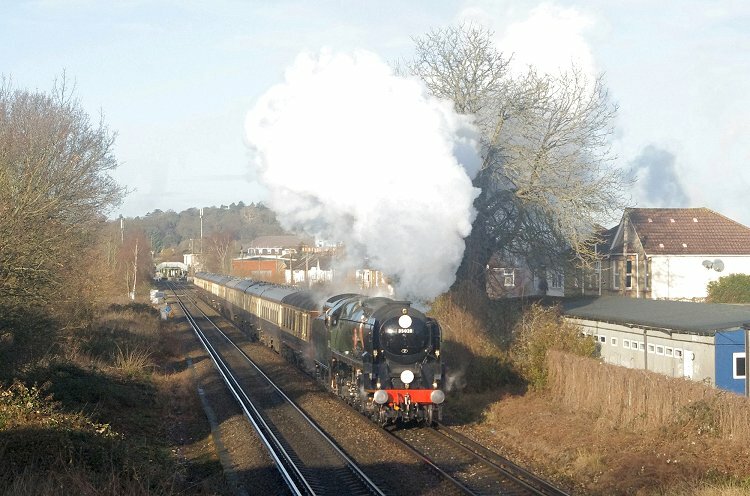 Steam locomotive 45212 approaches Locke King Road overbridge west of Weybridge with train 1Z82 from London Victoria to Portsmouth Harbour. 31st May 2018. 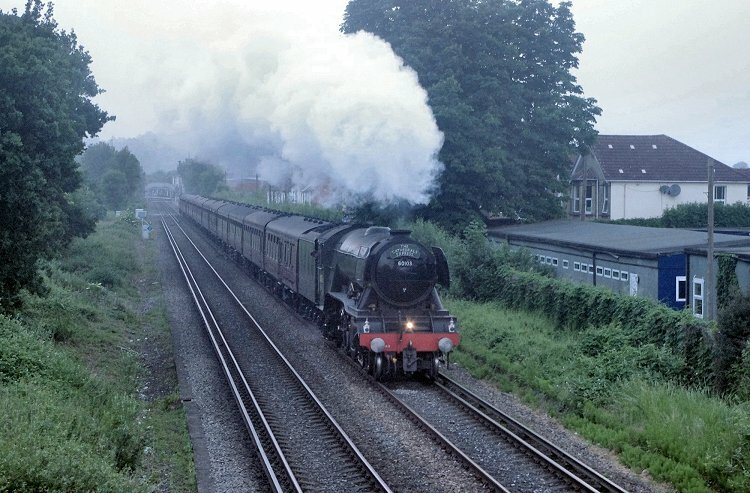 Ex-LNER A3 Pacific steam locomotive 60103 "Flying Scotsman" has passed through Chertsey station and is seen at Addlestone Moor at dusk hauling train 1Z75, a circular tour from London Victoria. 13th May 2018. 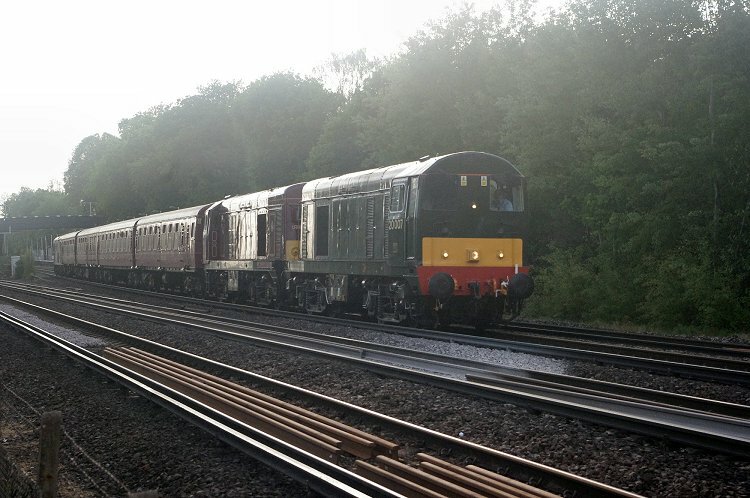 Class 20 diesel-electric locomotives 20007 and 20142 pass through Esher on the Up Fast in the evening with train 1Z50 from Swanage to Kensington Olympia. 7th May 2018. 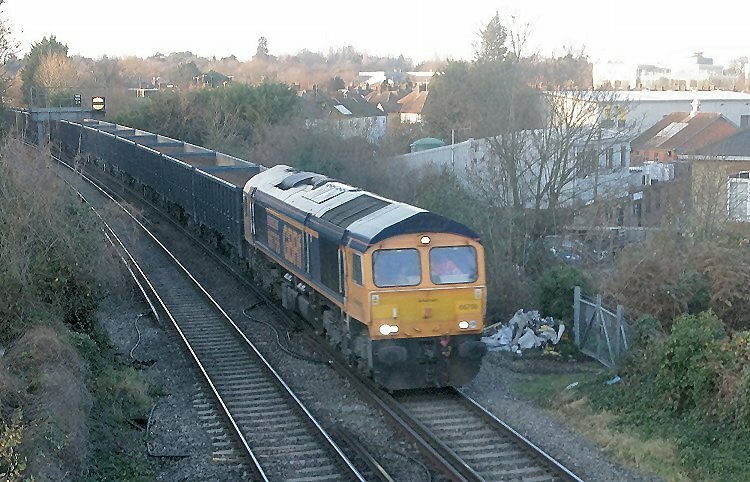 Colas class 66 diesel-electric locomotive 66847 approaches Addlestone Moor at Chertsey with train 6Y42 from Hoo Junction to Eastleigh. All wagons forming the train were constructed by mounting new bodies on underframes recovered from redundant wagons. Most of the underframes came from "Merry-Go-Round" coal hoppers. 3rd May 2018. 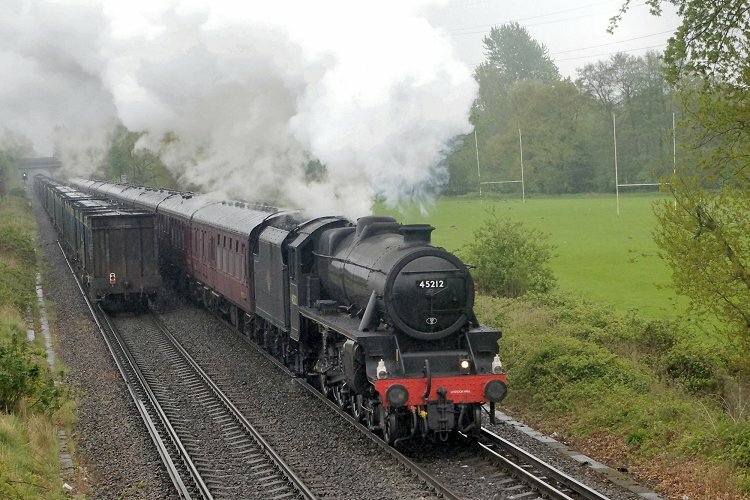 Ex-LMS 4-6-0 steam locomotive number 45212 heads train 1Z82 as it passes between Chertsey station (in the distance) and Addlestone Moor with a train from London Victoria to Bath Spa. 27th April 2018. 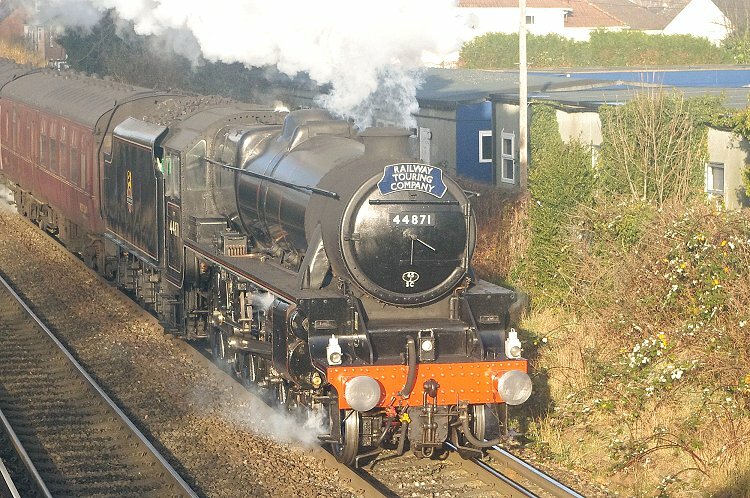 Ex-LMS Black 5 steam locomotive 45212 heads train 1X27 from Swanage to London Victoria as it passes Addlestone Moor at Chertsey. 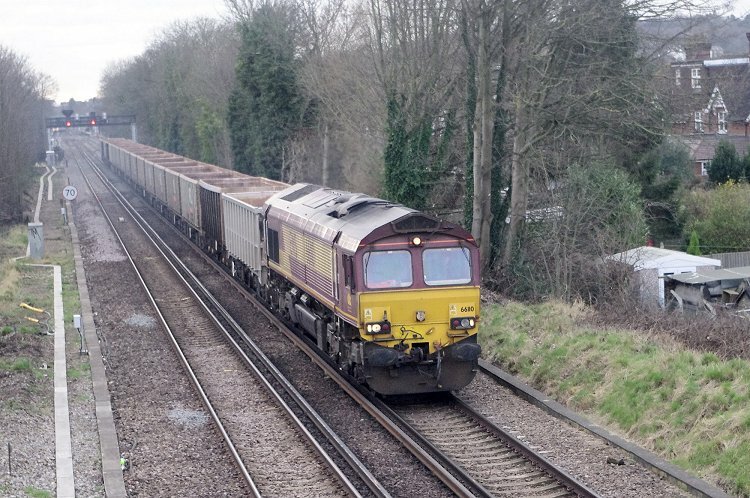 On the other track, train 4Y19 comprised of flat wagons carrying gypsum containers is on its way from Mountfield to Southampton Docks. 11th April 2018. Colas Rail's 37116 heads a test train through Esher station on the Up Slow line, forming train 1Q53 on its way from Eastleigh to Wimbledon. 21st March 2018. 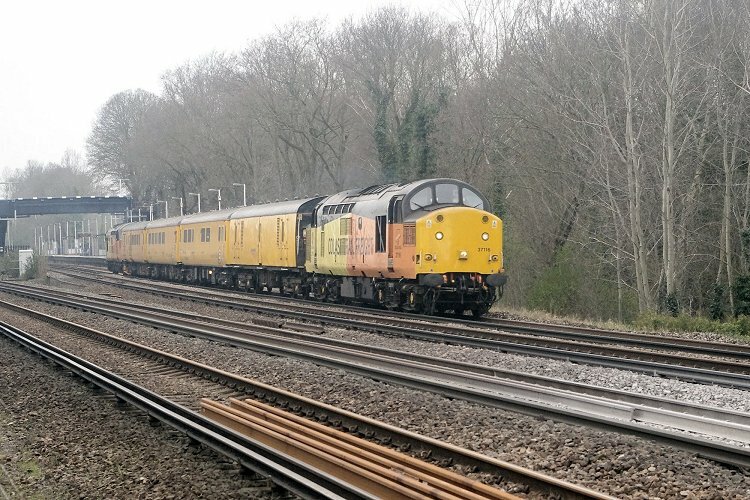 Class 50 diesel-electric locomotive 50008 "Thunderer" passes West Byfleet hauling newly refurbished wagons from Eastleigh to Willesden as train 6Z51. 14th March 2018. 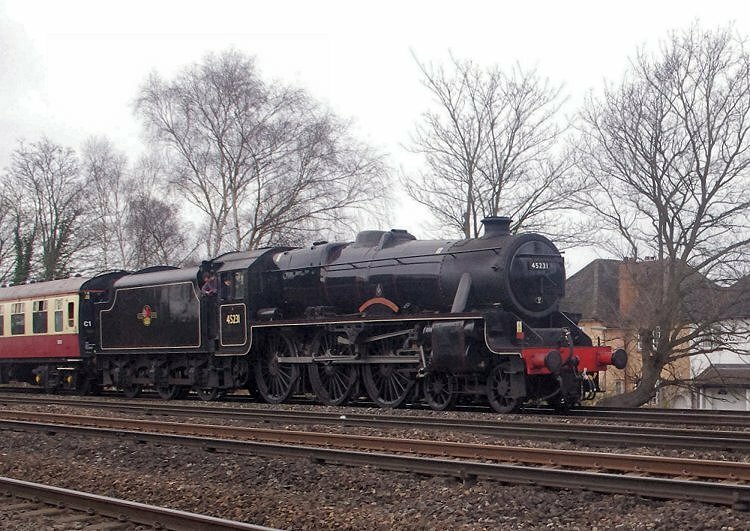 Steam locomotive 45231 "Sherwood Forester" moves from the Mid-Hants Railway at Alton to Southall locomotive depot with its support coach as train 5Z77. Photograph taken at West Byfleet. This locomotive was built by W. G. Armstrong Whitworth & Company at Newcastle-Upon-Tyne in 1936 as their works number 1286 and entered traffic as LMS number 5231. 4th February 2018. DB diesel-electric locomotive 66024 in EWS colours hauls engineering materials train 6N03 from Eastleigh to Wimbledon as it passes Esher in very weak light. 2nd February 2018. 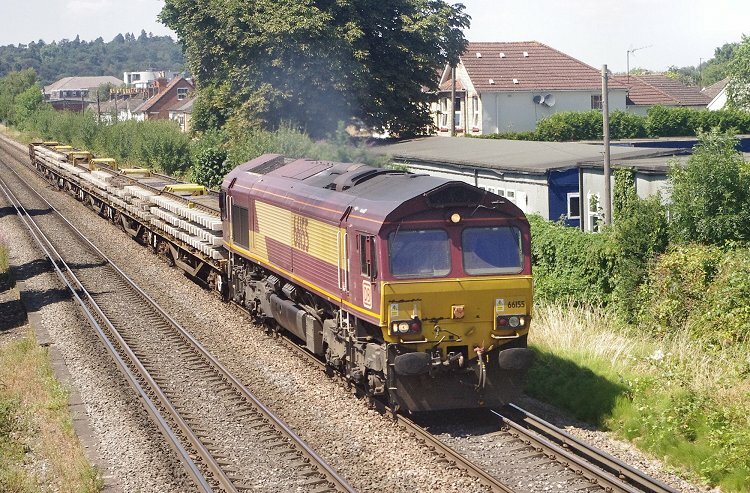 DB diesel-electric locomotive 66110 in EWS colours hauls empty wagon train 7V00 from Newhaven to Acton as it passes Holmethorpe at Redhill in poor light.